I hadn’t planned to write about Valentine’s Day but then something so sweet, so unexpected happened that I wanted to share it with you. It had been a rough morning when I heard my doorbell ring. As I opened the door anticipating more work in the form of UPS packages, utility worker questions, or door-to-door sales pitches, I was greeted by my smiling neighbor. In her hand was a plate of pink heart-shaped cookies with a note. I must have looked shocked and I don’t even recall greeting her before she said, “These cookies are for you.” For me? For me! My neighbor is a sweet young married woman with a young son. We are in different seasons of our lives, follow different faith traditions, and don’t cross paths socially beyond our sidewalk. Yet here she was with Valentines. We chatted for a few minutes, hugged, and each of us went back to work. Because of her love I’m inspired to share some sweet pink heart-shaped love with you. Love is how we think. We need to know what love is and what it isn’t. Love is patient, love is kind. It is not jealous, it is not pompous, it is not inflated, it is not rude, it does not seek its own interests, it is not quick-tempered, it does not brood over injury,it does not rejoice over wrongdoing but rejoices with the truth. It bears all things, believes all things, hopes all things, endures all things. Love never fails. From there, love is how we feel. Love feels sweetness more than fear. It feels generous, trusting, selfless and brave. Love gives gifts small and big. Quality and quantity time. Kind words and encouragement. A hug. And pink heart-shaped cookies. This entry was posted in Character, Feel, Friends, Relationships and tagged Cookie, Family, Love, Quote, Valentine's Day. Bookmark the permalink. Thank you Angie for sharing. I hope you enjoyed the cookies. A lovely gesture from your neighbour! 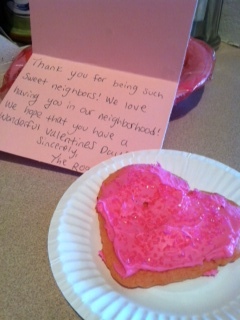 A sweet neighbor is such a gift! If you were my neighbor, perhaps you would bring me your secret recipe olives 🙂 I’ll need to give you cookies! It is true there is usually no comparison between homemade food and bought one. The special thing about the olives, are not only the herbs, which I admit I wouldn’t know all the names in English to tell, you know , you just learn what to pick from an early age. I was lucky enough to have this kind of getting know how in an early age about such things in Greece back in the sixties. The other thing are the olives themselves, they belong to an old species, not widely cultivated, we are lucky to have some of those trees still at that area. So , every time I go during Spring my neighbour gives me my ” share” and then I have to search around in the mountains for the rest. But it is fun , I like it and I ‘m looking forward to it ! I would give you some , for sure ! I like this , an olive holiday, I am going to tell it to my neighbours in the village. I still have to wait a little bit – one month- ! Count the days! I do see her as a friend, someone who wants my good. And I want to good as well. It is so nice to have different circles of good people in life!